Learn how to grow spinach in a pot from seeds and cuttings. 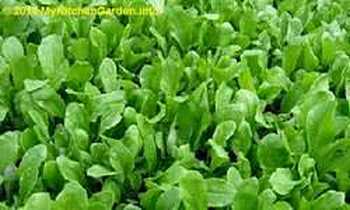 You can grow your own iron rich spinach (iron rich foods) at home from seeds, stems, roots, without seeds and cuttings following the spinach growing tips given below. Spinach (Spinacia oleracea) dark green leaves are rich in iron, calcium and vitamins A, B, and C, that are excellent for salads and for cooking. It is a great healthy food loaded with antioxidants (antioxidant rich foods) providing many health benefits. Growing spinach in containers is quite easy. Spinach is best suited to cooler weathers (15-18°C or 60-65°F), the seeds will not germinate at temperatures greater than 24°C (75°F). In hot summer weathers, the spinach plant grows a seed stalk (bolt) as it is very sensitive to heat. It is better to plant early and plant frequently, may be every 3-4 weeks until the end of cool climate. March is an best time to plant spinach in Australia including Sydney, but it can be planted till August in cool places. There are a few spinach varieties like Space, Tree, etc. which are bolt-resistant. Plant them under partial shade, mulch and give lots of water. Growing Garden Beds or Pots? Spinach can be grown at home in containers or garden beds, starting from seeds or cuttings. It is quite easy to grow spinach in containers. You can use a 10-12" pot size for growing spinach at home or any wide box with drainage holes at bottom. I have used a Styrofoam container for growing spinach. Spinach Plant Spacing: If growing spinach in garden beds, keep suitable spaces between the plants to allow air circulation. Select a site with full sun to light shade. In warmer days it can be grown in a shade area. You can grow spinach indoors, on a sunny window or use indoor light. Spinach grows best in slightly alkaline soil (pH 6.5-7.5). Add wood ash or crushed eggshells to make the soil alkaline. Spinach needs a well-drained soil. Dig the soil to about 1 ft deep and remove all the weeds. Add compost (homemade compost) and manure or sprinkle a good handful of high nitrogen fertilizer and work the soil well. Prepare the bed about a week before sowing/planting. The best way to grow spinach is to grow it from seeds (growing vegetables from seeds). You can also grow spinach in pots using the roots of spinach you buy from supermarket (How to grow spinach in pots ). The seedlings can be propagated in advance, but growing spinach from seedlings is not recommended as seedlings are difficult to transplant due to shallow root system. The garden shops sell spinach seedlings and if you prefer to grow spinach from seedlings, then transplant them to ground or container very carefully, without damaging their roots. Buy the seedlings in small single plant prunets. Sow the seeds:Soak the spinach seeds in water at room temperature for 24 hours. Sow seeds 1/2 inch to 1 inch deep, separated by about 10-12 inch and cover lightly with soil and water well. Or you can sprinkle the seeds in the bed or a large container. The seeds will germinate in 10 to 20 days, depending on the weather conditions. Mulch the plants with sugarcane mulch or any other mulch. When the seedlings sprout to about 4 inches tall, thin them to 10-12 inch apart. You can eat your thinning. Growing spinach requires regular watering, so water the plants regularly to keep the soil moist. If it is very hot, you can spray some water on the leaves. Feed the plants with a liquid fertilizer such as fish emulsion or compost tea every second week. You can harvest spinach in 40-50 days after sowing the seeds. One way to do this is start harvesting the outer, older leaves first and then gradually working your way in to the center of the plant as those leaves mature. You can also just cut the whole plant off at the base. I generally harvest the smaller, outer baby spinach leaves by cutting the leaves at the stem. You can cut all the leaves which start to mature. The spinach plant produces edible leaves for about five weeks. You can harvest the whole plant between 8 to 10 weeks after sowing seed. But do not wait too long to harvest, because once the plant matures, spinach will taste bitter and the plant will start flowering. The development of arrow shaped leaves is the sign that your spinach will soon bolt. As soon as you see a pointy leaf, harvest all your spinach before it has a chance to turn bitter on you. Spinach plant can be attacked by leaf miners, mildew, bolting, mosaic virus/blight, fusarium wilt and aphids. Downy mildew which causes yellow spots on leaf surfaces, occurs during wet weather. Leafminer larvae can produce tan patches. Slugs eat spinach. Monitor for aphids regularly and remove them with a stream of water. Keep enough space between your spinach plants for good air circulation. Water the plant in the morning and don't wet the foliage. Spray your spinach plant with Eco oil or pest oil to prevent damage from insects and moths. Plant disease resistant varieties. The English spinach is a fairly trouble-free winter veggie crop. Broad beans, cabbage, cauliflower, celery, eggplant, onion and peas can be grown in the same bed as spinach. Spinach can be frozen for later use. Wash the leaves, dry and place them in a resealable freezer bag. Place in the freezer. Can be used within 4 months.